BOCA RATON – Based on FAU coach Charlie Partridge’s comments, it doesn’t appear as though quarterback Jason Driskel is in much danger of losing his starting spot to understudy Daniel Parr. In Monday’s weekly meeting with the media, Partridge said that Parr is struggling with some of the basics of new offensive coordinator Travis Trickett’s offense. Though Partridge declined to go into specifics, he made it clear that at the moment Parr isn’t handling that aspect of the position nearly as well as Driskel is. Parr, a redshirt freshman, and Driskel began a quarterback battle in the spring that ended roughly a week before the start of the season with Partridge naming Driskel the Owls’ starting quarterback. A redshirt sophomore, Driskel threw for two scores and rushed for another in the season-opening victory over Southern Illinois, but hasn’t thrown a touchdown pass since and the Owls have only two touchdowns in the two games that followed – both losses. In Saturday’s blowout loss at Kansas St. Driskel suffered through his worst outing as a collegian, throwing two interceptions and fumbling twice in the 63-7 FAU loss. Parr played nearly the entire fourth quarter, entering the game after Driskel piloted the Owls on their lone touchdown drive. 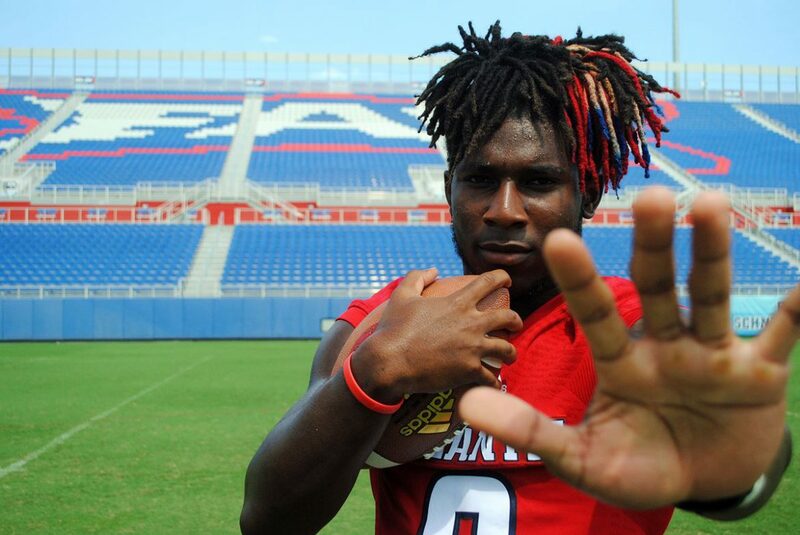 One of the most prized recruits ever to sign with FAU, the strong-armed Parr completed one of his four pass attempts against the Wildcats, covering four yards. He was also sacked once. In mop-up duty the week prior against Miami Parr’s lone pass fell incomplete. He was also sacked once. 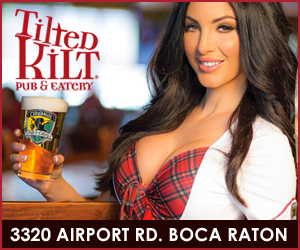 BOCA RATON – When FAU’s defense struggled in recent years the Owls elected to simplify their scheme and the overall defense improved. That’s not an approach that will help FAU’s surprisingly ineffective offense this season. 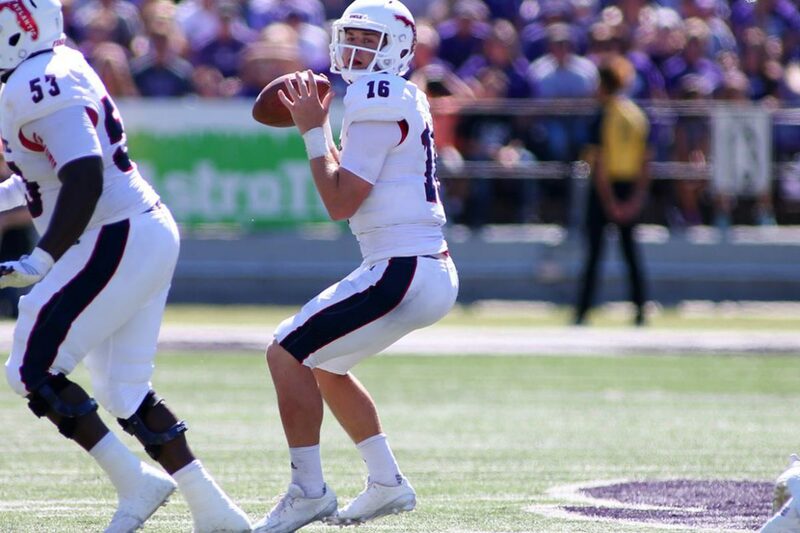 FAU played without three starting offensive linemen in Saturday’s 63-7 loss to Kansas St. – the worst defeat in program history. Left tackle Reggie Bain is out for the year following a motor scooter accident that occurred near the end of fall camp. Right tackle Kelly Parfitt suffered a knee injury in the season’s second game, while guard/center Roman Fernandez incurred an undisclosed injury in that same contest. Partridge said he hopes both are ready for Saturday’s game but also added that there will be no changes to depth chart for Saturday, which a spokesman clarified to mean that the Owls will proceed under the belief that Dillon DeBoer will remain at center, Bryan Beck will get his second start at left tackle and Antonyo Woods will start in place of Parfitt. True freshman Brandon Walton, who along with Beck and Matt Weiner, shuffled through the left tackle position at Kansas St., will continue to receive playing time. The constant realignment along the Owls’ offensive line is the major factor behind one of the worst offenses in the nation. The 18.3 points per game FAU is averaging during the Owls’ first three games ranks No. 114 out of the 128 FBS schools. Only seven schools are averaging fewer than the Owls’ 292.3 yard per game. Partridge accepted the blame for the Owls’ issues. Each Sunday during the football season OwlAccess.com writers Chuck King, Jake Elman and Matt Wilson dissect the previous day’s FAU football game in a feature we call “Four Down Territory.” Here’s our analysis of FAU’s 63-7 loss to Kansas St.
King: The total ineptitude of FAU’s offense. Injuries have made a mess of the offensive line. Receivers are dropping passes. Quarterback Jason Driskel is struggling with accuracy and looks flustered. Three games into the season FAU has no identity on offense. The Owls have only run 11 plays inside the opponents red zone all season. Somewhere Brian Wright is chuckling. Elman: How lethargic the Owls looked from the second the game kicked off. Fine, they lost to Miami a week ago and fine, they’re now just leaving Florida for the first time this season, but who came in expecting a 56 point loss? It’s easy to look at this team and say ‘eh, they’re not that good’, but this is a talented roster that is more than capable of hanging in with the big boys. Kansas State played a great game, but to enter the locker room at halftime down 42-0 just a week after keeping it close with Miami for the first 30 minutes speaks volumes about how the Owls view themselves right now. If next week sees the same result where players look like they’re ready to just quit and get back home, we could easily see the fans in South Florida boo Charlie Partridge and his team off the field – and no one would blame them at all. Wilson: Buddy Howell’s lack of production. He was only able to run for 34 yards on 13 carries. He has not been held to these kinds of numbers all season. He was not a big factor. Partridge called him the main back earlier in the week and Kerrith Whyte upstaged him. King: Kansas St. running back Winston Dimel became the second ball carrier in as many weeks to score four TDs against FAU. Think Ball St.’s James Gilbert is looking forward to Saturday? For FAU, Kalib Woods has emerged as the Owls only true threat in the passing game. His 39-yard catch along the sideline that set up FAU’s lone score showed the ability to win a battle with a defensive back that the redshirt junior has often displayed in practice but has rarely been evident in games. Elman: It may be easy to pick an offensive weapon like Winston Dimel and his four first-half scores, but I’m giving my Player of the Game to the entire Wildcats offensive line. Yes, there were a lot of penalties and yes, they weren’t perfect when flags weren’t being thrown, but when you manage to keep a quarterback upright and not let Trey Hendrickson or any of the other Owls pressure him, you deserve a pat on the back. Honestly, you could really point to Hendrickson being contained as a key reason why the Wildcats tore into FAU for 60 minutes; the defense rides on the star defensive end and when he’s struggling, the rest of the team will struggle. Wilson: Dimel was the second back in as many weeks to run for four touchdowns against the FAU defense. He only ran the ball 5 times for 19 yards but he put up as many touchdowns as Howell has on the year. King: Fans filled social media with calls for Daniel Parr to replace Driskel at QB, but Charlie Partridge made the right decision by sticking with Driskel as long as he did. The coaches clearly feel that Driskel is the better quarterback and FAU has to figure out how to make this offense work. Driskel and that unit need all the practice they can get. Parr played nearly the entire fourth quarter but didn’t show much that would indicate he should supplant Driskel. Will Partridge re-visit the quarterback battle this week? It’s possible, but Driskel should be the one who starts against Ball St.
Elman: This could fall more into the biggest surprise as well, but why would Partridge risk injury to his starters by playing them to start the second half? Down 42-0 in a non-conference game, wouldn’t it have made more sense to call on Daniel Parr, Motor Singletary, and other backups to take the snaps for the rest of the second half? Not only does it help with their development and get them in-game reps, but it saves guys like Driskel and Howell from potentially sustaining an injury in a blowout loss that means nothing other than fighting for pride; but what’s more important going into the start of Conference USA play come week five: pride that you didn’t give in against a non-conference opponent, or having to start second and third string guys because you kept the starters in for nothing? Wilson: Not putting in Parr earlier. The game was over half way through the first half. Driskel was getting banged up. Partridge and offensive coordinator Travis Trickett should have put in the young gun Parr and let him get some reps. When the game is a blowout, most people give the young guys a chance. Parr was not able to go in until the 4th quarter. Parr should have been put in earlier so he can see and develop. King: It’s early in the season, but Saturday’s game against Ball St. (2-1) is the most important game of Charlie Partridge’s coaching career. FAU looked bad in losses against Miami and Kansas St., but those losses were expected. If FAU defeats Ball St. the Owls will enter Conference USA play at 2-2 – well positioned for a run at bowl eligibility. A win over the Cardinals will quiet detractors who are hitting social media hard. A loss to the Cardinals could signal another lost season for the Owls. Elman: It’s been only three games and I don’t want to enter panic mode yet, but I think we’ve hit the point where we could see someone take a fall soon. The Owls have played twelve quarters in 2016 and only two of those – the second half of the season opener – has seen FAU operate on all cylinders and do their jobs, especially on offense. Through three games, the Owls have let up 30 points or more each time out despite a defense full of playmakers. We have one more week of pre-Conference USA play and if FAU enters week five with a 1-3 record, changes may really need to be made if this team and program are serious about contention. Wilson: The Owls have not shown that they can compete on offense with any team. The defense has been decent but when they are on the field for two thirds of the game, they get tired. Next week against Ball State may be the make-or-break moment for Driskel. If he cannot produce against a not-so-good Ball State, do not be shocked if Partridge and Trickett call on Parr to start the rest of the season. In each of the FAU’s first two games – one win, one loss – Charlie Partridge blamed his team’s struggles on little mistakes they needed to clean up. Partridge may need to hire a hazmat team to clean up the Owls 63-7 loss at Kansas St – the most lopsided loss in program history. Or better yet, he may opt to burn the video and simply move on. “We can’t pretend it didn’t happen,” FAU coach Charlie Partridge told ESPN West Palm in its postgame show. Kansas St. thoroughly out-played FAU in every phase of the game. After picking up a couple first downs on their first drive of the afternoon, the Owls fell apart. Jason Driskel sufferend through his worst game as an Owl, committing four turnovers – two by air and two by land. The Wildcats capitalized on the first three – scoring on the very next play each time. Seven seconds into the second quarter Kansas St. took a 28-0 lead and the contest was essentially over. Partridge switched to Daniel Parr at quarterback for most of the final quarter, but the redshirt freshman also failed to move the offense. Driskel completed 14 of his 24 passes for only 125 yards. Parr’s lone completion in four tries covered four yards. “We’ve just got to keep growing with Jason,” Partridge said. Against Miami a week ago FAU’s defense managed to keep the Owls in the game through the first half despite the offense’s struggles. That wasn’t the case on Saturday, when the Wildcats racked up 207 yards rushing in the first half and 336 yards on the afternoon. “I expected our D-line to play better,” Partridge said. The Wildcats took a 42-0 lead into the halftime break following Dimel Winston’s fourth TD of the first 30 minutes and basically played their reserves the remainder of the way. For good measure, FAU surrendered a 75-yard punt return to Dominque Heath in the third quarter. A 39-yard Driskel-to-Kalib Woods completion set the Owls up in their opponent’s red zone for the first time in almost two full games. Two plays later Buddy Howell took the ball the final yard for his fourth touchdown of the season, providing the Owls with their lone score. Four times on Kansas St.’s opening possession FAU forced a third down play. The Wildcats converted all four times, the final one a touchdown. That score gave K-State a 7-0 lead and FAU didn’t come close to stopping the Wildcats’ offense until the game was decided (which was in the first quarter, by the way). Jason Driskel looked overwhelmed on Saturday. His throws sailed, the ball slipped out of his hand and the offense couldn’t get out of first gear. He left after leading the Owls on their lone touchdown drive and, fortunately for him, Parr didn’t do any better. No quarterback controversy – yet. Partridge said he hired Travis Trickett because he liked the way his offense at Samford made in-game adjustments to counter what Partridge’s then-Arkansas team did on defense. At some point will Trickett start making those kinds of adjustments at FAU? To be fair to Trickett, Driskel and Parr, FAU’s offensive line is a complete mess. Without tackles Reggie Bain and Kelly Parfitt, Dillon DeBoer moved back to center and Bryan Beck made his first start at left tackle. True freshman Brandon Walton also saw his first game action. It’s hard to imagine the Owls enjoying much offensive success until this problem is solved. FAU coaches insist they are a good tackling team. They may be the only ones who believe that. At times on Saturday the Owls looked like the object of the game was to see how far the guys wearing purple could run. 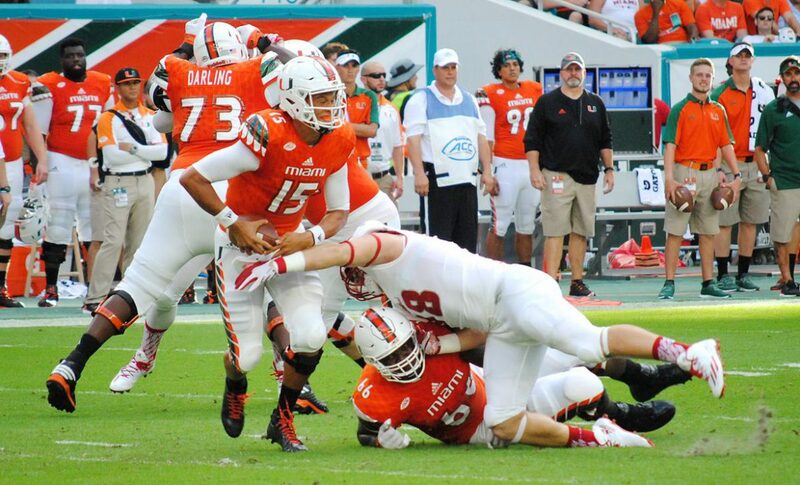 That effort comes one week after Miami counted nearly 30 missed tackles against their RBs. 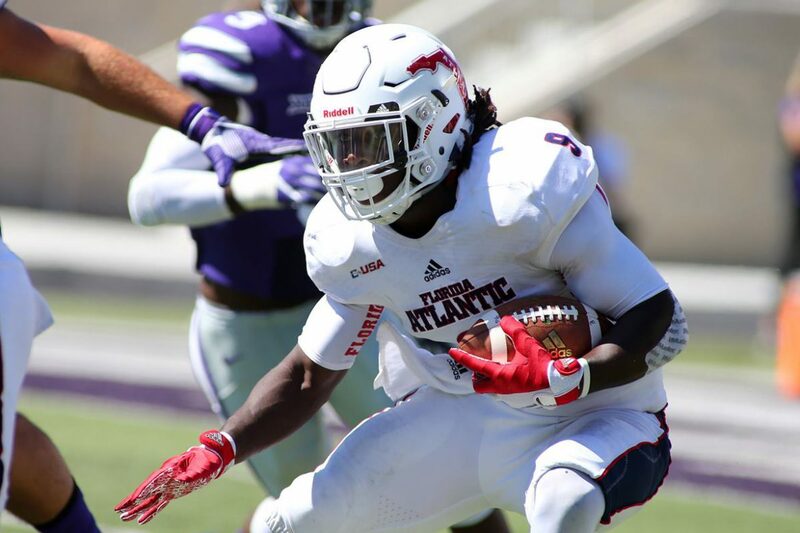 2 – Consecutive weeks FAU has allowed a running back score four touchdowns. 3 – Turnovers by Jason Driskel in the first half, two fumbles and an Int. 7 – Catches for Kalib Woods, covering 84 yards. He’s clearly become Driskel’s go-to guy. 10 – Penalties committed by FAU, many negating the few good plays the Owls had. 34 – Yards rushing for Buddy Howell, his lowest total of the year. 54 – Yards rushing for Kerrith Whyte to lead the Owls. 108 – Points Kansas St has totaled in its two games against FAU, dating back to 2006, outscoring the Owls by 101. FAU returns home to face Ball St. in its final non-conference game of the season. Kickoff at Howard Schnellenberger Field on Saturday is slated for 6 p.m.
FAU receives opening kickoff. Kerrith Whyte doesn’t reach the 20. Penalty puts ball inside 10. FAU moves the ball near midfield on 1st drive before punting. Schomp punt pins Kstate at 11. KState basically running over FAU right now. Steven Leggett already had to leave game. Now safety Soroh is hurt. Holding penalty negates KState TD. Next play, another TD. Wildcats convert all four 3rd downs on opening drive, lead FAU 7-0. FAU goes 3-and-out on second possession, looking discombobulated in the process. RB Motor Singletary prominent early. KSU 7, FAU 0 1Q. One play later, another K-State score. FAU almost refusing to tackle. This one might be over already. KSU 21, FAU 0 1Q. FAU imploding already. Driskel simply drops ball while throwing. K-State has it again. #PopWarnerFootball. KSU 21, FAU 0 end 1. Yes, it’s early, but Partridge has to consider giving Parr a chance soon. Offense doing absolutely nothing. FAU getting absolutely embarrassed. K-State scores on first play of 2nd quarter. QB untouchced from 12 yards out. KSU 28, FAU 0. CB Shelton Lewis with a sack. FAU forces a punt, takes over inside own 10, trailing 28-0 in 2nd Q. Penalty wipes out good Kerrith Whyte run. Driskel then sacked and fumbles. K-State recovers at FAU 1. FAU concludes one of the worst first halves in program history trailing KSU 42-0. Will halftime adjustments include a run to the bus? #NoHuddleNoPoints FAU hasn’t snapped from the red zone in 7 quarters. Only 9 plays inside opponent’s 20 all year. Driskel is 6-of-13 for 36 yards, with a pick and two fumbles. Not his best half. Kansas St. out-gains FAU 312-84 in the first half. Wildcats have 207 yards rushing already. Hurry back to your TVs. Second half is about to begin. Don’t want to miss any of the exciting action. KSU 42, FAU 0. FAU forces KSU punt. QB Driskel back out there to start the second half for FAU. Another 3-and-out from FAU. Who could have seen that coming? BREAKING NEWS: FAU is in the red zone. First time snapping the ball inside the opponent’s 20 in more than two games. Kansas St. 49, FAU 0, End 3Q. Ocie Rose forces a fumble. Herb Miller falls on it. Daniel Parr in at QB. FAU mounting a comeback down 49-7. Parr’s first series looks a lot like most of Driskel’s. Instead of a 3-and-out, though, it’s a 4-and-out. FAU comeback on hold, down 49-7. K-State adds one more score because, well, there was still some time left. Wildcats are going to win this one. KSU 63, FAU 7. 1 minute remaining. 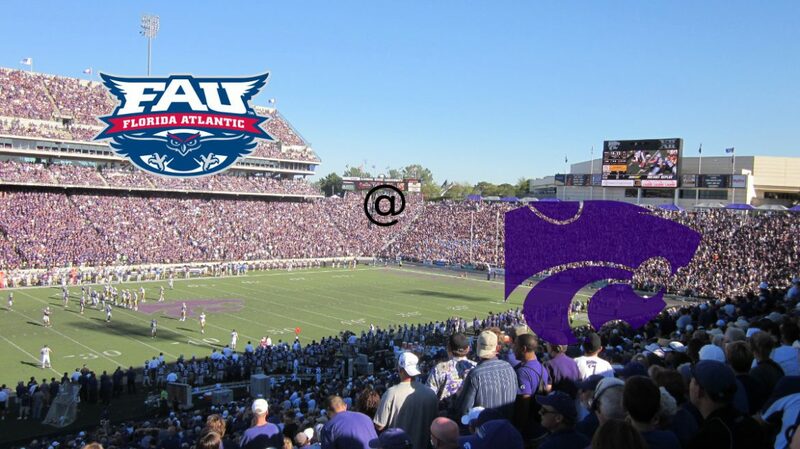 Final from Manhattan: Kansas St. defeats FAU 63-7. FAU falls to 1-2. Returns home next week to play Ball St.
FAU @ Kansas St. Live! FAU coach Charlie Partridge found a fun way to kill time before the start of FAU’s game at Miami last week. Partridge, a South Florida native, picked up a football and played catch on the Hard Rock Stadium field that sits only a few miles from the house he grew up in. On Monday morning Partridge explained that his routine for road games is different than his home routine. He tells why in this video. Partridge and the Owls are on the road again today to take on Kansas St. Will he head to the field for a quick toss of the football prior to kickoff at Bill Snyder Family Stadium? We’ll know soon. BOCA RATON – FAU running backs coach Jared Allen saw something familiar in Buddy Howell’s 38-yard touchdown run against Miami last week. Actually, it was more like someone familiar. “He was very Alfred-like, a physical runner,” said Allen, who was also a member of Howard Schnellenberger’s staff when Alfred Morris powered his way through opposing defenses for the Owls. Trailing 24-3 in the third quarter with FAU facing a first-and-10 on the Miami 38, Howell spun off a would-be tackler in the backfield, changing the flow of the play. About five yards beyond the line of scrimmage the 6-foot-1, 215-pound Howell absolutely flattened defensive back Michael Jackson; then Howell won the race to the pylon for FAU’s lone touchdown of the game. Morris made a living running through, and often over, as many would-be tacklers as he ran around. Howell’s TD run against Miami – and the patience he showed waiting for a hole to open on his 49-yard touchdown run against Southern Illinois, were runs that Morris, FAU’s all-time leading rusher and current Dallas Cowboy, would have appreciated. Howell opts not to similarly compare himself to Morris. Instead he says he wants to be the best player he can be without comparing himself to other players. Howell’s main focus on every play is to get to the end zone – a mindset that has led to dominating runs. “I was refusing to be stopped, that is my mind set each and every play,” Howell said. Howell is one of the bright spots of the Owls offense and his re-emergence as a threat isn’t a surprise to offensive coordinator Travis Trickett. He has three rushing touchdowns in his first two games, which ties his career high for rushing touchdowns in a single season. He also has rushed for 203 yards. Howell has embraced the idea of being the leader of FAU’s running backs by becoming a mentor to others in his unit, especially Freshmen Kerrith Whyte and Devin Singletary. He preaches preparedness. Howell didn’t see the field until the seventh game of his freshman year. In his first collegiate appearance he rushed for 118 yards and a touchdown against Western Kentucky. Howell uses that game as a motivational teaching tool for the younger running backs. Howell also knows first hand that carries can be given and they can be taken away. Last year Trey Rodriguez took reps from him and Jay Warren, and even though he was the Owls’ leading rusher last season, Howell only rushed for 598 yards. Partridge dismissed Rodriguez from the team prior to fall camp and Warren has been slowed by a leg injury sustained in fall camp. Without those two, and running behind a beat-up offensive line, Howell has been the lone productive running back for the Owls this season. Howell may get some help on Saturday against Kansas St. Warren, who has only one carry all season and is the best pass protector among the backs, showed some of the explosiveness he’s been lacking thus far this season. “He had a great week of practice where it was like: There it is,” Allen said regarding Warren’s burst. Regardless of the health of Warren and the development of Whyte and Singletary, the Owls will continue to lean on Howell. The junior faces a tall task. In its lone game this season Kansas St. (0-1) faced another good running back, opening the season against Stanford and last year’s Heisman runner-up Christian McCaffery – who rushed for 126 yards and two touchdowns on 22 carries. Howell is not same kind of running back as McCaffery but he does have that ability to wear down the Kansas St. defensive line. Aside from McCaffery, the Wildcats were able to shut down the run, only allowing the rest of the team to gain -17 yards. Where: Bill Snyder Family Stadium, Manhattan, Ks. Key for the Owls: Get the ball to the outside. Kansas St. defenders are big and strong, and by now they’ve certainly realized that bottling up Buddy Howell goes a long way to halting FAU’s offense. The Owls need to counter the Wildcats’ defensive strength with speed, at that means getting the ball to perimeter in the hands of Whyte, Henry Bussey, Pico Harrison and Kalib Woods. Key for the Wildcats: Shake off the rust. Kansas St. is coming off an unusual Week 2 bye-week. An opening week loss to Stanford likely has the Wildcats anxious to get back on the field. K-State racked up 335 yards of total offense but only found the end zone once. Starting fast wasn’t a problem for the Wildcats in their only other game against the Owls. Justin McKinney ran the opening kickoff back 88 yards for a touchdowns, launching Kansas St. toward a 45-0 win in 2006. Key Match-up: Until FAU fixes its offensive line issues, the Owls’ front five will be the focus of the offense. Already missing left tackle Reggie Bain, FAU will also be without starting right tackle Kelly Parfitt, who injured his knee against Miami. FAU may elect to move Dillon DeBoer back from left tackle to the center spot he occupied last year and most of fall camp. That will leave someone inexperienced, be it Tarrick Thomas, Byers Hickmon, Brandon Walton or Bryan Beck at left tackle. 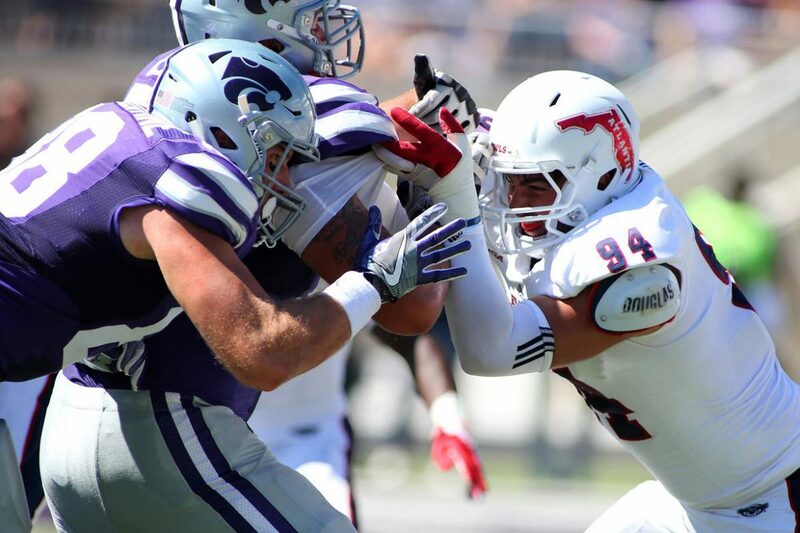 FAU coaches spent the week talking about how impressed they are with Wildcats DE Jordan Willis and NT Will Geary, both preseason All-Big 12 selections. The Owls will have their hands full up front. Seeing Red: FAU has only snapped the ball nine times inside its opponents’ red zone thus far this year. Yes, the Owls have scored on some big plays, but they’ve lacked consistent drives that wear down defenses and eat up clock. “I think the biggest thing with our offense is getting first downs,” quarterback Jason Driskel said. “Once we get a couple first downs we can push the tempo a little bit. Both teams we’ve played this year struggled once we got moving.” The good news for FAU? The Owls have turned both red zone drives into touchdowns. Running Return: Kerrith Whyte is averaging 29.0 yards per kick off return this season and nearly broke a couple of those returns against Miami for really big yardage. “It gives you confidence to see, OK, he’s starting to get game ready,” Partridge said. Expect the Wildcats to kick away from Whyte on Saturday, which could give true freshman Devin Singletary a chance to get loose. BOCA RATON – FAU’s current sack leader knows firsthand what an opposing quarterback feels like when the Owls’ all-time sack leader drives him to the ground. Near the end of fall camp, in front of the entire team, coach Charlie Partridge asked Haiden Nagel, along with defensive backs Anthony Hamilton and Alfred Ansley – all three walk-ons – to stand in front of the the entire team and sing the FAU fight song. The trio only managed to get a few lines into the song before Partridge displayed a surprise message on the screen behind them – a message that the rest of the team, but not Nagel, Hamilton and Ansley, could see. The three singers had earned a scholarship for this season. The room erupted – and Nagel didn’t know why. Nagel sports a huge grin while telling the story, even while admitting that Hendrickson got him pretty good with the free shot. Two games into the season, Nagel is proving that he deserved the scholarship. He beat out incumbent Hunter Snyder and Nick Internicola to earn the starting spot on the opposite side of the line from Hendrickson, and is currently sixth among Owls with nine tackles. His modest one sack is one-half more than Hendrickson or any other defensive lineman, and is enough to tie linebacker Rashad Smith for the team lead. Nagel’s sack, which came in the season-opener against Southern Illinois, wasn’t his first. In 2014 he started six games as a redshirt freshman, recording two sacks. He didn’t get a sack last season, recording only six tackles as a redshirt sophomore, but enjoyed a revival in the spring that carried over into fall camp, ultimately earning Nagel his scholarship – and a sack from FAU’s career-leader that he’ll likely never forget. 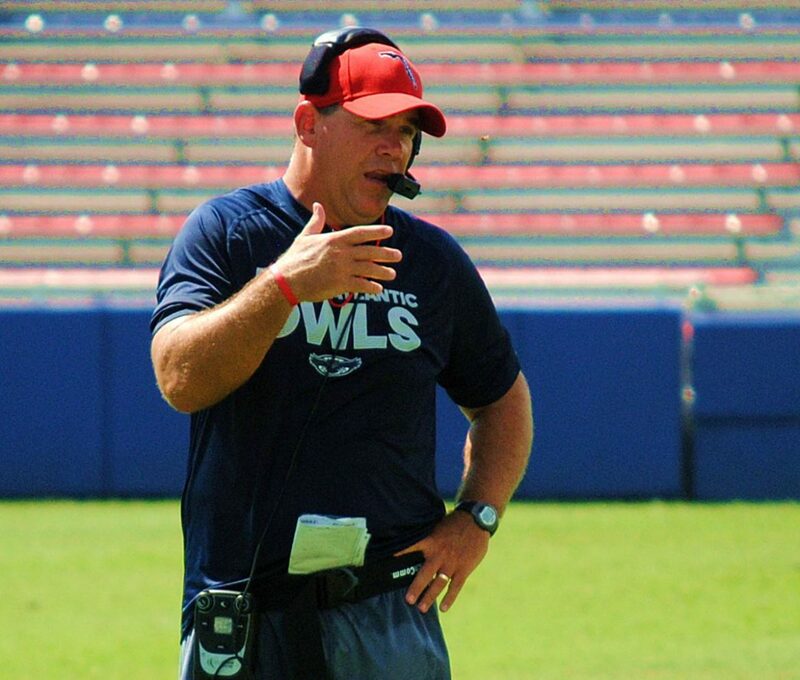 Welcome to OwlTalk, the premier podcast covering FAU football. Every week our FAU football insiders, ESPN West Palm’s Brian Rowitz and our Chuck King, delve into all aspects of the Owls from a perspective that no other source can provide. This week Rowitz and King review what went wrong in the Owls’ loss at Miami, discuss FAU’s growing issues along the offensive line and preview Saturday’s game at Kansas St.
For FAU fans looking to be prepared for each week’s game, this podcast is a must.